Denise has received a host of prestigious awards, including her stats as #1 Team at Prudential Florida Realty out of 47,000 agents and membership in Prudentials Chairman's Diamond Circle, representing the top 1/2 of 1% of all Prudential sales associates. It was a successful acquisition indeed, when Prudential merged with Denise Rubin International Realty in 2012 and she hasn't looked back, being #1 every year since. Prior to opening her own office, Denise was in the prestigious Legends Society at Coldwell Banker, the top 1/2 of 1% of 85,000 agents worldwide. Denise has won numerous awards including 22 Best Awards from the Builders Association of South Florida. Among those awards was Best Real Estate Professional of the Year for Personal Achievement 5 times! She also won the BASF Platinum awards for the Best REALTOR Website 5 times. Best Multi-Media Marketing Campaign of a Single Family Home, and Best Multi-Media Campaign Marketing, Direct Mail Marketing for Real Estate, and Best Outdoor Product/Billboard for Real Estate. Recently, she won East Coast Top Marketing Sales Professional Team awards. She is a Member of the Master Broker's Forum for the Top 250 Real Estate Professionals. Other awards include, Woman of the Year for her personal accomplishments, Who's Who in Luxury Real Estate and Best Aventura based REALTOR. She was named one of Miami's Power Women of Real Estate and she was featured in the Best of South Florida on TV. She won a Top Awards from "Realtor.com" and the list goes on. Celebrities, renowned public figures, athletes and numerous household names have used the services of Denise to assist them in finding their ideal luxury home or condo from South Beach to Palm Beach. Most recently she sold a condo to actor Donald Sutherland and sold a condo for New York Real Estate Mogul Jeff Sutton. A steadfast dedication to meeting every client's needs, she always goes the extra mile with a smile, putting her clients first before her private time and personal time. Denise Says, "I dare to be the best in this profession and to dedicate myself to success." When clients work with the best they get the best results. "Having clients stay with me for life is the key to my success." Repeat business and referrals from past clients, along with all the new business generated from her award winning marketing has accelerated her business to new levels, so Denise has an International group of agents to help server her clients. We go the extra mile. We don't just sell them a property, we give them personalized service and expertise every step of the way. 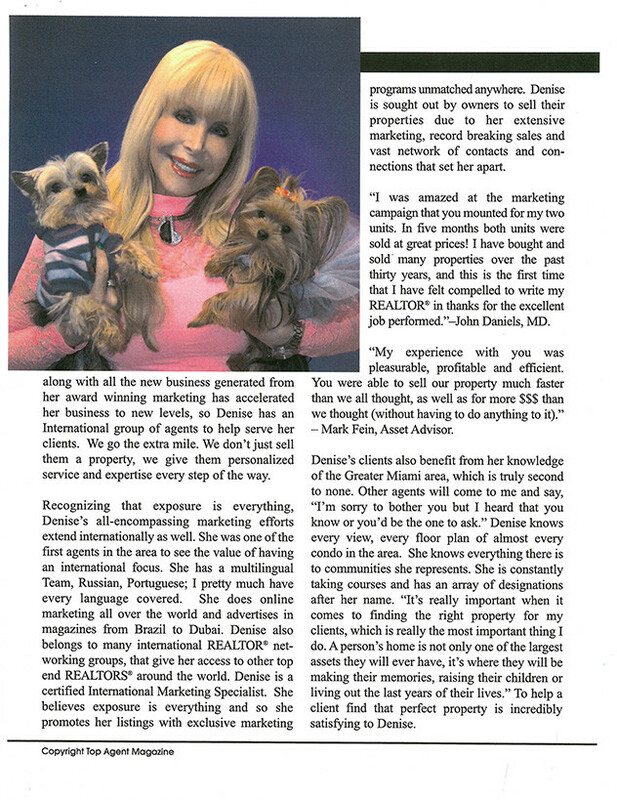 Recognizing that exposure is everything, Denise's all-encompassing marketing efforts extend internationally as well. She was one of the first agents in the area to see the value of having an international focus. She has a multilingual team, Russian, Portuguese; I pretty much have every language covered. She does online marketing all over the world and advertises in magazines from Brazil to Dubai. 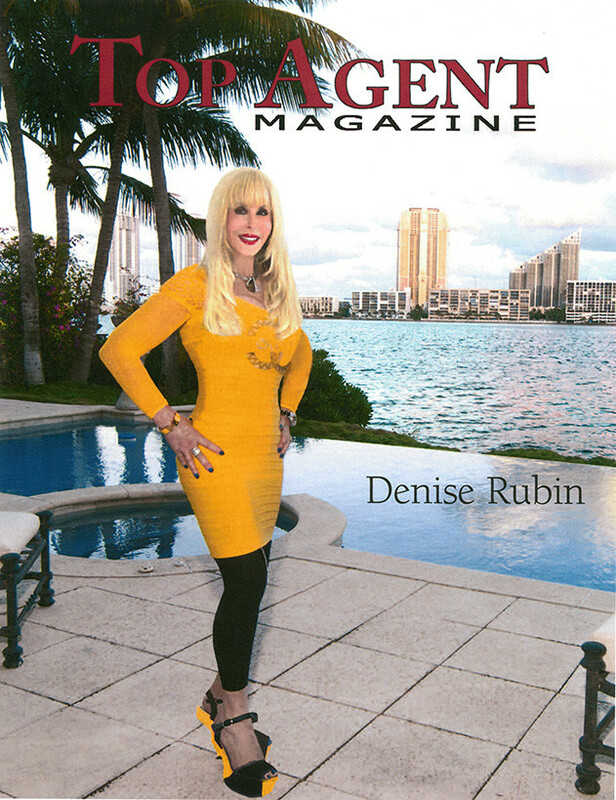 Denise also belongs to many international REALTOR networking groups, that give her access to other top end REALTORS around the world. Denise is a certified International Marketing Specialist. She believes exposure is everything and so she promotes her listings with exclusive marketing programs unmatched anywhere. Denise is sought out by owners to sell their properties due to her extensive marketing, record breaking sales and vast network of contacts and connections that set her apart. "I was amazed at the marketing campaign that you mounted for my two units. In five months both units were sold at great prices! I have bought and sold many properties over the past thirty years, and this is the first time that I have felt compelled to write my REALTOR in thanks for the excellent job performed" - John Daniels, MD. 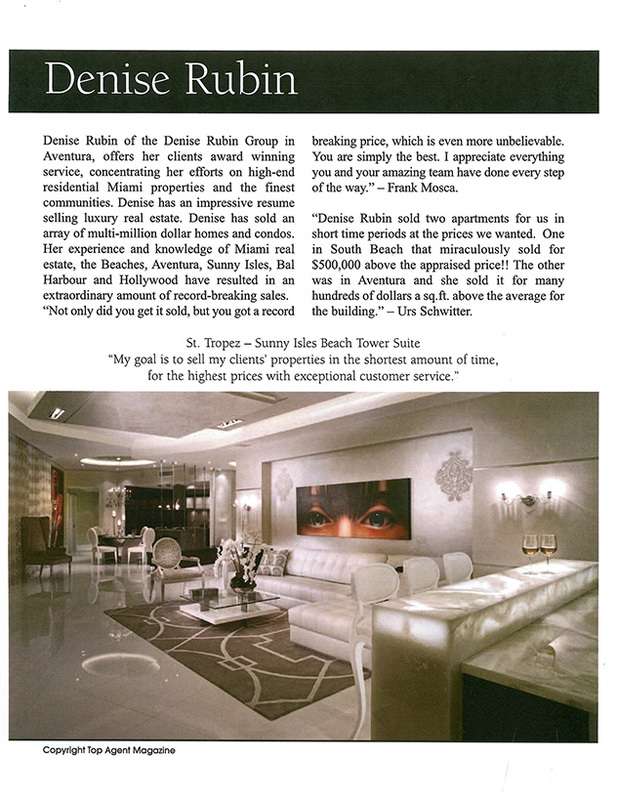 Denise's clients also benefit from her knowledge of the Greater Miami area, which is truly second to none. Other agents will come to me and say, "I'm sorry to bother you but I heard that you know or you'd be the one to ask." Denise knows every view, every floor plan of almost every condo in the area. She knows everything there is to know about the communities she represents. She is constantly taking courses and has an array of designations after her name. "It's really important when it comes to finding the right properties for my clients, which is really the most important thing I do. A person's home is not only of the largest assets they will ever have, it's where they will be making their memories, raising their children or living out the last years of their lives." To help a client find that perfect property is incredibly satisfying to Denise.